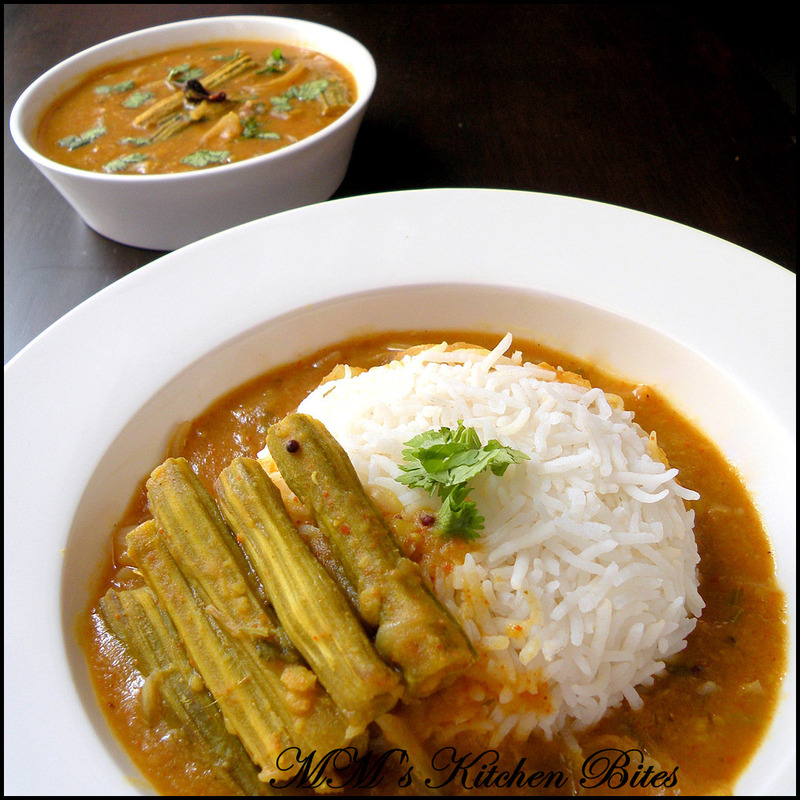 MM's Kitchen Bites: Sambhar Dal...my hybrid rose!!! Soak tamarind in half cup hot water for 15-20 minutes. Extract a thick pulp and discard the rest. Keep aside. Wash the dal till water runs clear. Soak it for about 20 minutes. Heat oil in a deep pan on medium heat. Add mustard seeds and fenugreek seeds. When they start spluttering add in the dried red chilies, hing, onions and curry leaves. Stir for about a minute and add in the drumsticks. Sauté for a couple of more minutes. Add in about a cup of water and let the mix come to a boil. Lower the flame, cover the pan and cook till drumsticks are almost done. Once drumsticks are almost done, add the tamarind extract, red chili powder and sambhar powder. Stir well and let it cook for a couple of minutes. Add the dal to the pan and let it simmer for about 10 minutes. Adjust seasoning and the consistency to your liking – if too thick, add some water; too thin, let it simmer for another few minutes. Sambhar is not supposed to be either too thin or too thick – IMO, adjust consistency to your liking and call it what you want. If you don’t have Tamarind, add tomatoes. Typically if tamarind is added, it is called sambhar, if tomatoes are added, it is called dal. Go ahead and add either or both. You can add packaged tamarind extract as well – just read the package and check for taste, as it can be a little sweet at times. Adjust seasoning accordingly. You can replace drumsticks and add any vegetable of your choice – would suggest not adding more than 2-3 different kinds – ghiya/bottle gourd, drumsticks, tomatoes, onions, eggplants, carrots, green beans, pumpkin are some of the options. Refer here on how to choose the right kind of drumsticks and how to eat them as well! Mix all dals and roast on low flame with a tsp of oil till they crisp up and turn reddish. Keep aside to cool. Individually roast all other ingredients in the same pan except turmeric and hing. Keep aside to cool. Pls. ensure that you don’t burn any one of them. Once everything is cooled down, dry grind into a fine powder. Done! !